Well last year at this time, some of our corn had been in the field for a couple of weeks as we planted our first corn field on April 16th. This year has not gone so well and we have yet to plant the first seed for 2012. The Farmer and his parents just keep busy doing all kinds of odd jobs around the farm to keep themselves from going crazy from all of the rain. (If only we could send the rain to our friends in Texas that so desperately need it.) Let's face it, just like our homes, there is always something to be done at the farm and there is never a dull moment. We just prefer certain jobs to others and this time of year we want to be planting corn and soybeans. Since there isn't much action on the farm in terms of planting, I thought I would dedicate this Farmer Fridays to my mom in honor of Mother's Day. As you know, The Farmer is the 4th generation of his family to farm and raise pigs in our county. 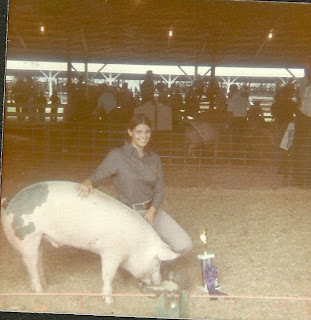 Although I didn't grow up on a farm, my mom did and she made sure we had a great appreciation and love for agriculture and pigs in particular as she was from a pig farm, of course. So it is very exciting for me to be raising my kids on our family's pig farm. I just wish my maternal grandpa was here to see it. 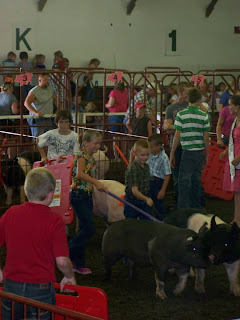 "4-H is a great organization that encourages family togetherness. I joined 4-H because I wanted to belong and share experiences with my family and community. 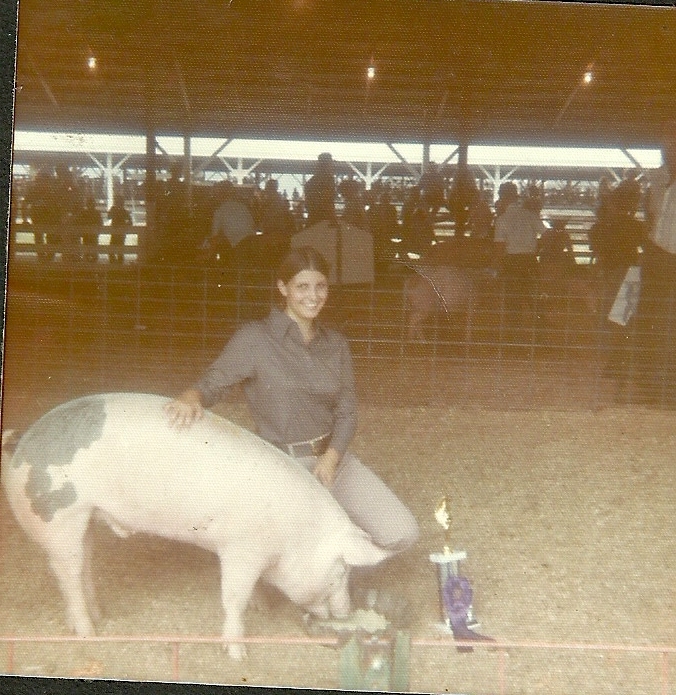 My interest in 4-H Club work began and developed by helping my family on the farm. I was eager to help in any capacity. My interest in swine developed by helping with the farm chores. I started by helping feed our hogs and cleaning the feeding area between the barns. Everything did not always go smoothly. Such as the day I was helping my dad with some sows and I had to take a flying leap, head first, over the fence; or the day I was trying to stop a pig and he ran between my legs. 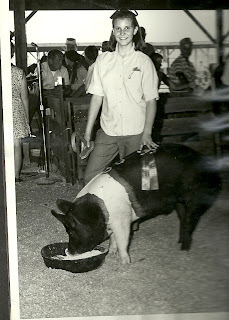 With the help of my father I eventually exhibited responsible and independent behavior in caring for our hogs. By working with my pigs, I learned the importance of organization and management in the swine business. Raising hogs is a business that requires hard work. I learned early to be alert, observant, and to take orders. Hogs are important to my family because they are the source of our income, food, and way of life." Truthfully, I don't know if I could say it any better myself. 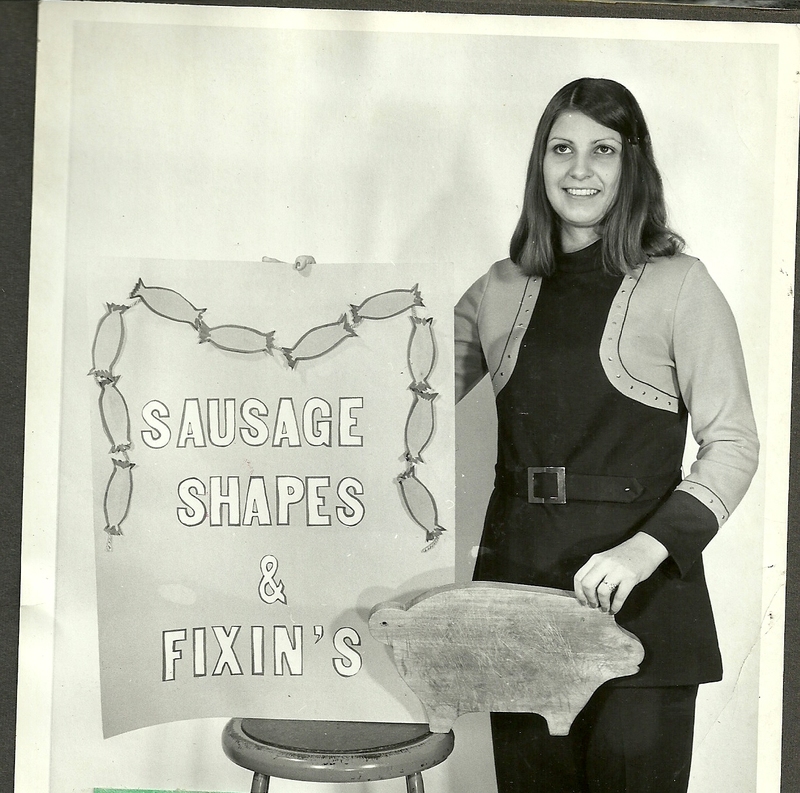 Our likeness even goes one step further as my mom even gave a cooking demonstration on a local TV station during her 4-H career. Although I've yet to give a cooking demonstration on TV, it appears she was ready for The Real Farmwives of America and Friends In the Kitchen with Gooseberry Patch partnership years before it existed. 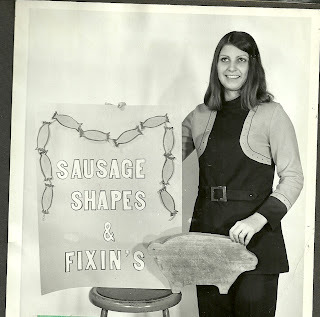 Additionally, I think her recipe would have made my list of Links I Love for a Mother's Day Celebration if only she had blogged about it back then. Big Sissy carrying on the pig showing tradition... she gets it from all 4 sides of the family. Nice tribute to your Mom. Great post. Your mom is beautiful! What a fantastic post! How cool to have photos and the essay. Love it. Your daughters will cherish this post when they are adults. Happy Mother's Day! Love the retro photos. Your mom was sure blazing a trail for you and your girls to follow! Loved this! After 10 years of showing pigs myself, I cannot wait to pass on the tradition to my daughters. Happy Mother's Day! Farmer Fridays - Did you know we raise rocks?